New Share Button on Android sends any page to your Majestic account. 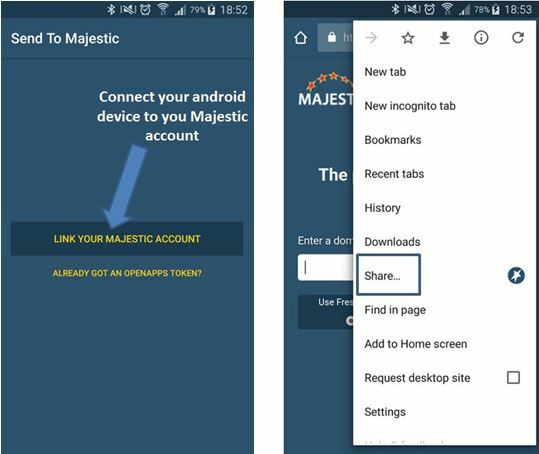 Today, we are excited to announce the release of ‘Send to Majestic’, a simple new plugin that allows users to instantly send URLs straight from their android devices to their Majestic bucket list by using the built-in share menu. The application only requires you to log into your Majestic account once to connect your android device to your Majestic subscription. This nifty piece of functionality works seamlessly alongside the Majestic site, empowering users to send URLs on the go to their very own safe haven that they can come back to, to analyse at their own convenience. Simply go onto the Google Play store to install ‘Send to Majestic’ and have some fun. This is just the initial release; we are hoping to develop this application further with the help of customer feedback. So please, leave your comments below, we’d love to know what you think. This will be great to collate first tier "out of reach" principles, for later analysis via cliquehunter to find up and coming authorities potentially more open to contact. As a web developer who is looked to for occasional light dabs of whitehat seo and online pr, this addition makes my job far more portable. Thanks guys, my hats off to the author for such an elegant hack! This should be useful for easier access of sites that needs to be re-visited.